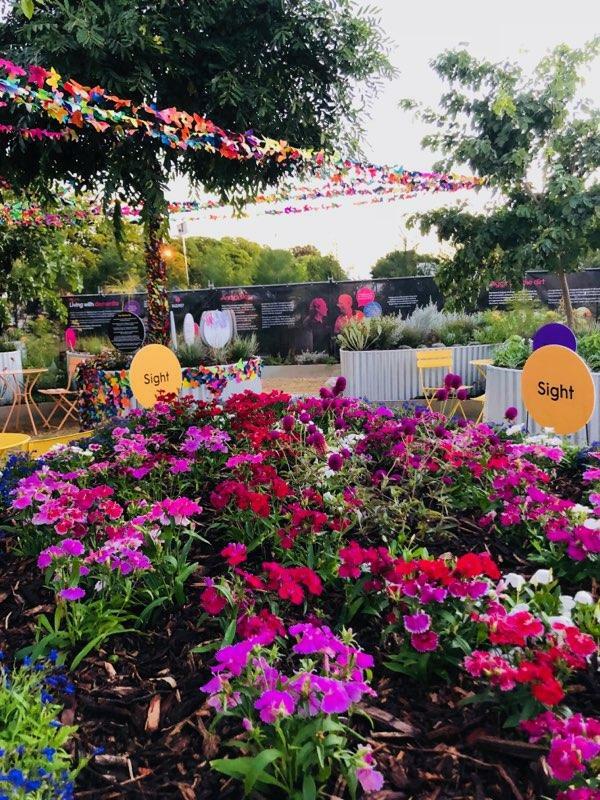 There’s sure to be a chorus of approval when visitors to this year’s Perth Garden Festival stumble across the carefully constructed dementia garden known as Kaleidoscope. The team at community service provider Chorus – which was formed in October 2017 as a result of the merger of Volunteer Task Force, Care Options and Community First – has spent almost a year developing the garden, which aims to raise awareness of dementia in addition to the value and joy to be found in gardening. 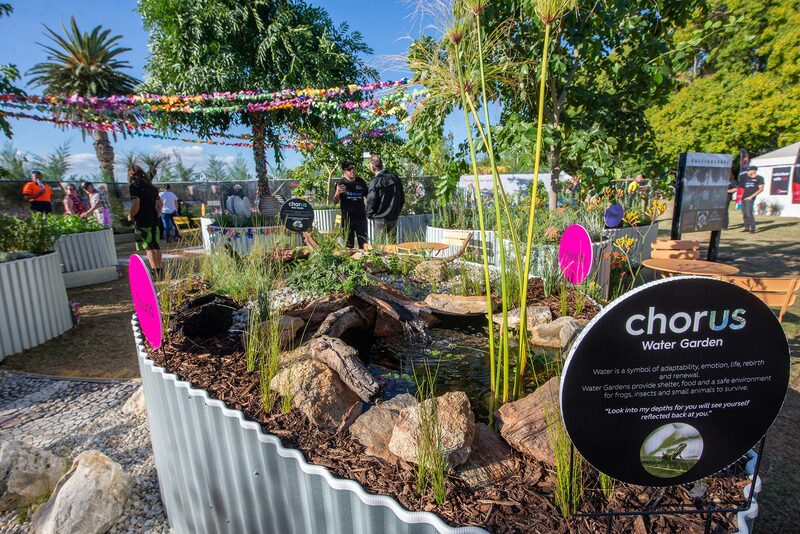 This year’s sensory garden display includes raised garden beds representing six ‘petals’ which, together with a ‘flower centre’, focus on seven domains of wellbeing – Meaning, Growth, Security, Autonomy, Identity, Connectedness and, at the centre, Joy. The first raised garden that visitors will encounter is focused on our sense of smell and includes plants and herbs including Lavender, Rosemary and scented Pelargonium. And according to Andy Harold, Chorus’s Regional Gardening Advisor, smell is incredibly important, although it is also important not to have scent overload. “The first thing people do in a garden is bend down and smell the plants,” explains Andy, who has worked for what is now Chorus for over 14 years. The second area that visitors will encounter is a raised garden with the sense of sound at its core. It has been designed to mimic a native wetland, with a gentle water feature in the middle that visitors will no doubt find calming and peaceful. “This aspect of our sensory garden gives individuals the opportunity to hear and experience sounds through our water feature and plants,” Andy explains. Moving on, the third garden to have been developed is known as ‘Native Touch’ and includes a range of native plants which, in Andy’s words, ‘can take a great deal of handling’. These plants are all interesting to touch and feel, whilst also being non-toxic – something particularly important for plants in a sensory garden. The fourth garden area is focused on taste and, as such, includes culinary herbs. The garden comprises basil, parsley, lettuce, chives, sage, fennel and thyme, and those living with dementia are welcome to try any of the plants, with many of the herbs particularly taking seniors on a trip down memory lane, and back to their childhood experiences of taste. The sense of sight is the focus for the fifth aspect of the garden display, with a blaze of colour featured in the raised garden bed. Flowers including Lobella, Dianthus and Vinca are featured in an assortment of bright colours which have been proven to be particularly attractive to not just people with dementia, but everyone. The last of the raised garden beds is devoted to bush tucker and, again, the sense of taste. It features many indigenous plants and is also focused on symbolically bringing different cultures together. A rainbow serpent runs through the middle of the display. 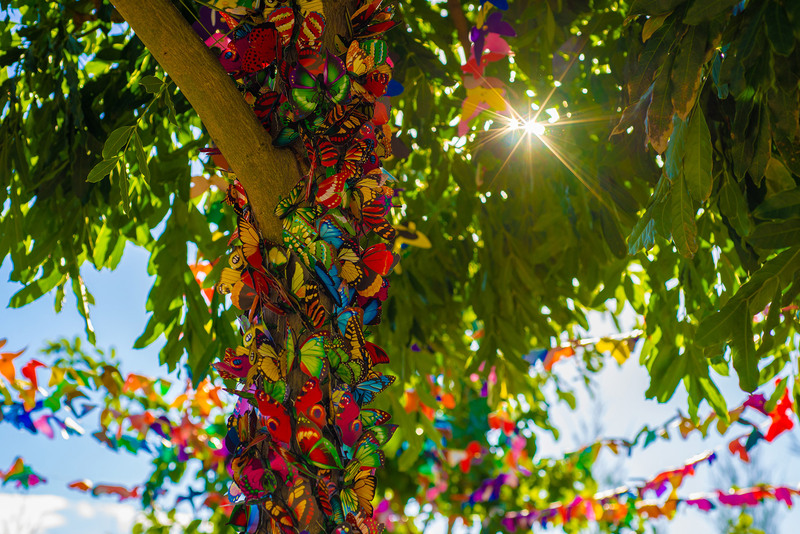 And at the heart of the garden – in many ways the main element – is a display devoted to Joy, and includes an installation of over two and a half thousand paper butterflies. “Joy can include contentment, happiness, delight and enjoyment,” explains Andy. “For us at Chorus it’s all about good outcomes and positivity, focusing on what the possibilities and not limitations. Tina Newman, Manager Client Services, adds that Chorus’s values – Responsive, Practical, Empowering, Respectful – are also woven into this visual display, showing visitors what they mean to both the organisation and the community it supports. “Chorus has a fresh approach to community service and values including respect, purpose and dignity are at our core,” she explains. “We are so grateful to all of the sponsors that have either donated their time or resources for the garden because we couldn’t have done it without them. “It has been a project that has involved many people, employees, volunteers, family and sponsors all offering their willingness to work together to build a garden that tells a story that many hands have helped to create.